Time for a party at Station 8! 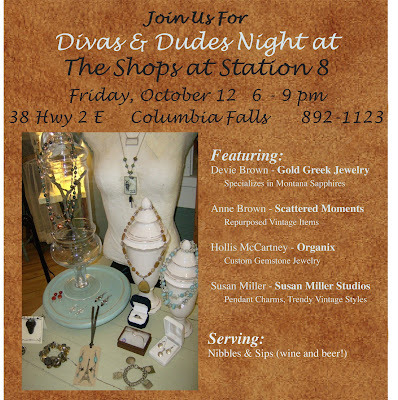 It's time for another great event at Station 8! We are celebrating autumn, with an evening gathering for guys and gals! Forward this invite to a friend, and Save the Date! You're all invited to this gala! Watches, old clock faces, watch jewelry. There's just something magical about timepieces. I adore these old fashioned pieces and love that there is a new appreciation for them! Old Big Bens, Baby Bens, kitchen clocks. When you pick one up its heavy, sturdy and feels like it can get the job done for you. The scratches and dents just make it all the more appealing to me. Just love this display that my girls put together! Barb and Betsy spent yesterday freshening our "Industrial Alley" with all of the galvanized, old wood pallet carts, arch salvage...doesn't this look appealing together? Did I mention that I love old cameras, as well as clocks? But of course! Works of art, things of beauty. All displayed on an amazing industrial rack! Just had to share some of our current industrial looks we have! I simply love autumn! The colors, the textures, the scent of outdoors is invigorating! An instant display using warm colors--it makes for a pretty tabletop. Why not show this handmade baby cap on a table?! My favorite c0lor to accent with is saffron. So warm and spicy. Got lockers? Time to get out the ghoulish decor and create a spooky vignette! Try lining up pumpkins on a bank of lockers, and spell out a spookilicious word using decals or stencils! Isn't this an amazing creation by Kristie Caratelli? She is one of our fabulous artists we feature in the shop. and just in, a primitive spinning wheel, that is 100 years old, and still works! Not only great decor, but an amazing symbol of handcrafted goodness. 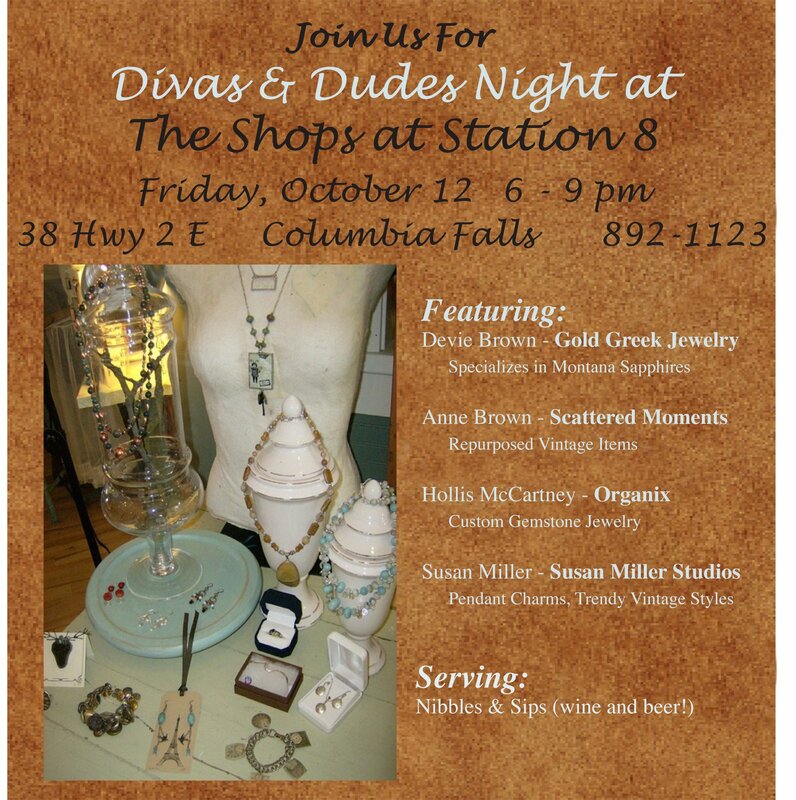 Introducing Organix Jewelry at Station 8! Who doesn't love beautiful, affordable, handmade jewelry? We have a new line of exquisitely handcrafted jewelry, called Organix at the shop! Each gem stone is carefully selected and placed with an eye to creating an elegant masterpiece! All natural materials are used, of the finest quality, and you'll find an array of sterling, copper and gorgeous gems, all one-of-a kind original creations. And so affordable! Come in and see what's new, from Organix! Time to change for autumn--your closet and home accents! Station 8 has the most amazing vendors! Jewelry, art, furniture, accent pieces--we have local talent galore in the store! And you can always expect to find intiguing displays set up--like this magnificent "lady" showing off her amazing jewels! Wouldn't she look cute adjacent to your dressing area, loaded with your own necklaces, brooches and gown? Perhaps with autumn here, it's time to find that perfect piece you've been hunting for, like this buffet in a crisp fresh color of light raspberry! Or perhaps a 1930's dresser in a soft mossy color would look perfect in your home! And don't forget the accents! We have warm wood tones that will add warmth and instant history to your home. And now that we will be gathering near the fireplace again, perhaps a nice sitting area with leather chairs would be your new favorite. come in and see our autumn collections! We're ready to share our inspiration with you! Fun at the vintage show in Missoula! Just sharing some of the fun shots of the good times we had at the Prairie Party this weekend! I just adore this vintage dress, and the young woman who tried it on looked so fabulous! Burlap & bling! A great combination! And they even gave us blackberry cobbler and ice cream at the end of the day. Rachel, does it get any better??? Praire Sisters party show in Missoula! We're here!! We're at the vintage show in Missoula, the Prairie Sisters party! The theme is Boots and Bling! The venue is awesome--we're in the old barns! We brought a few things...and just need to sort all of it out and make it pretty! But first, I need to clean! And we've got the bling! Awesome bling belts by the dozens! And bling necklaces, bracelets and earrings too! She is wearing a vintage ruffled skirt with leather tooled belts and handbag. An amazing antique chalkware figure that is so cool for a cabin look! We are having a blast at the show! Miss you all, but we'll share more stories and photos! There's noothing quite like a weekend getaway to recharge and reconnect with your spouse. We did just that for our 20th Anniversary, taking a train, and then a ferry to Friday Harbor, San Juan, and then on to Victoria BC! Rode the ferries between the islands. Wow! What views! And strolled the gardens of the Empress Hotel in Victoria, where we were 20 years ago, for our honeymoon! A blissful weekend, and we have much gratitude for each other and all our many blessings.